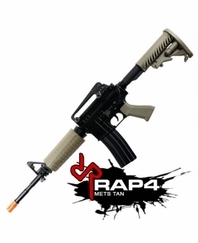 Introducing the RAP4 METS (Military Enhanced Training System), the world's first paintball marker that is identical to the legendary M4 rifle used by SWAT Teams, Special Operation Groups, and the U.S. Military. The M4 carbine, the U.S. Military's primary weapon of choice, is known for its solid construction, durability, and sustained reliability, and things are no different with the RAP4 METS. This marker is designed to replicate the look, feel, and action of the real M4. With features that mimic the M4, such as shell ejection after every shot, magazine fed paintball rounds, and the option of a collapsible or solid stock housing and disguising the CO2 cylinder. The RAP4 METS shoots .43 caliber paintballs which are loaded into alloy or biodegradable plastic shells. The latest improvements to the RAP4 METS line improve accuracy, range, and overall precision of the marker, not to mention the added realism of real-world functionality. 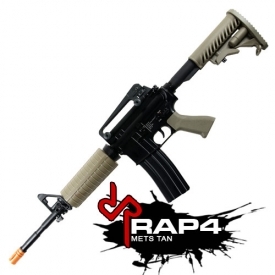 The RAP4 marker continues to set the standard for real-world paintball markers. With the release of the new updated and enhanced RAP4 METS, the best marker in the world just got better.